The 2015 Ford F-150 and 2015 GMC Canyon aren't the only interesting pickups at this year's Detroit Auto Show. Fans of towing, hauling, and general truck-yeah badassedness won't want to miss these rigs that were relegated to "also ran" status by car-centric show coverage. Robby Gordon's SST truck is hidden in a corner of the basement. You won't see a suspension setup quite like that on anything else, the Stadium Super Truck series is like a hybrid of motocross and hypermotard racing with a lot of jumps. Some say the Lingenfelter Reaper could be the Chevrolet "Raptor-fighter" GM won't build. Lingenfelter showed off a 398 HP supercharged Silverado at SEMA, but there isn't much fanfare around this prototype hidden across the hall from the Michelin Media Center. An "official reveal" is said to be around the corner. Speaking of anti-Raptors, the VIA XTrux is parked outside the main show floor, near the front entrance. The company is converting full-size GMs to totally electric propulsion, and claim this performance prototype will produce 800 horsepower. I sat down with their representatives and I'll have some details about their projects soon. Mopar has a CASE Edition Ram Heavy Duty next to a a couple dolled up Jeeps in their area across from Porsche. Besides the construction company's signature school bus yellow and a two-tone interior, my interest was piqued by the Ram/Snap-On branded toolbox that looked robust as Rocky in the 70's. The NASCAR Ford F-150 will debut at Daytona in February, but Ford has one hanging out in their VIP room away from the main show floor. It's a tube-frame race vehicle powered by Ford's NASCAR FR9 race engine. The NASCAR Toyota Tundra that will do battle with the F-150 on America's ovals can be seen at Toyota's corner of the show, behind a glass barrier near the 4Runner and range-topping road-going Tundra. What might have been my favorite exhibit at the 2014 Detroit Auto Show was the Ford F-150 2.7 EcoBoost Baja Prototype. It's easy to find near the new body style F-150 in Ford's main show section, but if you don't know what you're looking at you might brush it off as just a current bodystyle race truck. Built by famous Ford truck tuner Greg Foutz, this is actually the 2015 F-150 Ford used to torture test its new materials and 2.7 liter turbocharged engine in last year's Baja 1000. 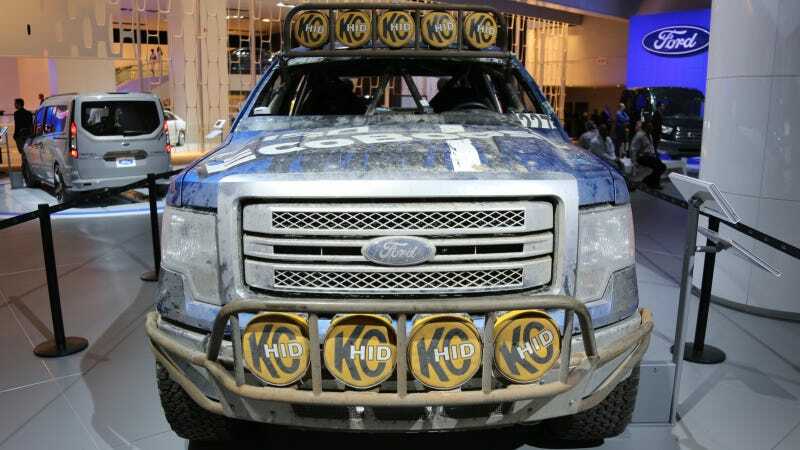 Using Ford's new aluminum alloy made in the 2014 shape, the truck was hidden right under our noses even as it rolled across the Baja starting line in the Prototype class. Staying as close to stock as possible down to the air filter, It finished the race without popping a tire. There's no chance you'll miss this Tundra; it's spinning on an elevated turntable in the middle of Toyota's area. But I'll give it honorable mention because it's just so darn trucktacular. Bass Pro Shops, modern military camo, the damn thing might as well say "Made In 'Murica" in huge letters on the side. Hey, it does! Truck yeah!